The kids are back in school and the fall season is upon us. That means it’s harvest time, and happily, autumn brings us excellent choices for eating healthy, seasonal foods. While we’re all for apple picking and trips to the pumpkin patch, there’s another crop that packs in a lot of health benefits in a tasty, natural package. This fall, choose pears. 1. Pears are filled with fiber. A medium-sized pear has 5 grams of dietary fiber—both soluble and insoluble—even more than a similarly sized apple. The insoluble fiber, or what we call “roughage,” is found mainly in the skin of the pear, and lends itself to better digestion. Soluble fiber balances digestion as well, and also has been shown to help remove LDL, or “bad” cholesterol, from the body and boost the immune system. 2. 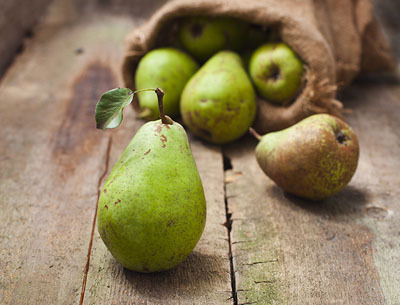 Pears are packed with phytonutrients. Aside from all its beneficial fiber, the skin of the pear contains at least three to four times as many phytonutrients as the flesh. These include anti-inflammatory flavonoids and cell-repairing antioxidants, which help prevent cell damage that leads to aging, diseases like cancer and heart disease, and nervous system problems. 3. Pears are one of the easiest foods to digest. Perhaps you’ve learned that pureed pears are often one of the very first foods to be fed to a baby, or served as a post-surgery reintroduction to solid food. This is with good reason: they’re pretty easy on the digestive tract. Aside from their water and fiber content, pears have a mild flesh that is low in acid, and considered to be a low allergic risk as well. 4. Pears are a good fix for a sweet tooth. A medium pear is only about 100 calories, and yet due to its fiber content and sweet flavor, it can help fill you up and also help you feel satisfied. When you want to avoid eating a sweet treat on impulse or resorting to a packaged snack, it makes sense to reach for a juicy, ripe pear instead. There are plenty of pear varieties to try beyond Bartlett, too. Red Anjou pears are sweeter and milder than their green cousins, and Bosc pears have firmer flesh so they hold their shape for baking. You can cook peeled pears with apples on the stove to make for a naturally sweet topping for pork or chicken—add a bit of diced serrano pepper to give it a tasty pop of heat. Check back in our next issue of The Xsport Life for Part 2 of this fall foods series: Fish. One of the easiest ways to get all the benefits of pears without any hassle is including them in your smoothies. Here are three variations of smoothie recipes that use pears in naturally delicious flavor combinations. Green Pear Smoothie: Blend 1 pear, 1 celery stalk, 2 cups of spinach, 1 cup of almond milk and several ice cubes. Cinnamon Fruit Smoothie: Blend 1 pear, 1 small apple, 1 small frozen banana, 1 cup of plain yogurt, 1 tablespoon of honey and several dashes of cinnamon. Pear Salad Smoothie: Blend 1 pear, ½ cup of cucumber chunks, 2 cups romaine lettuce, 1 tablespoon honey, 1 heaping tablespoon of nut butter and 1 cup ice water.